A non-foaming scrub face wash enriched with sea minerals, Vitamin C and Vitamin B3. Double scrub granules made from Apricot Seeds and Coconut Shell polish away pore-clogging impurities and dead skin cells that lead to a dull, uneven complexion. Spawake White Solution Double Scrub Face Wash leaves skin smoother, brighter and more refined with a luminous glow. Explore the entire range of Facewash available on Nykaa. 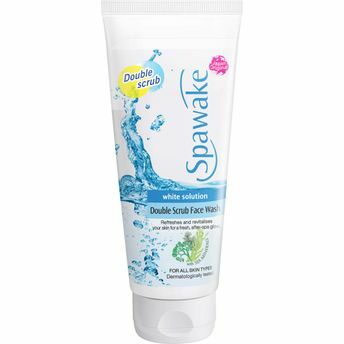 Shop more Spawake products here.Alternatively, you can also find many more products from the Spawake White Solution Double Scrub Face Wash range. Explore the entire range of Scrubs & Exfoliators available on Nykaa. Shop more Spawake products here.You can browse through the complete world of Spawake Scrubs & Exfoliators .Alternatively, you can also find many more products from the Spawake White Solution Double Scrub Face Wash range.